Numerous political buttons produced to support Republican candidates for Illinois state offices. Items include supporting Ryan for Governor, Jerry Weller for the U.S. House of Representatives, representing Illinois's 11th congressional district. 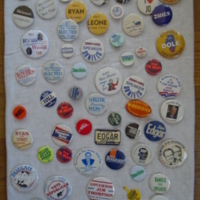 “Tony Leone Button Collection ,” UIS History Harvest, accessed April 18, 2019, http://uishistharv1.uis.edu/items/show/69.